This year’s World Wildlife Day, on March 3rd, is themed around big cats, as predators under threat deserving international protection. The high altitude valleys that connect the northern states of India with the Tibetan plateau, are home to vulnerable populations of snow leopards and bears, while endangered tigers live in reserves at the foothills of the Himalayans. 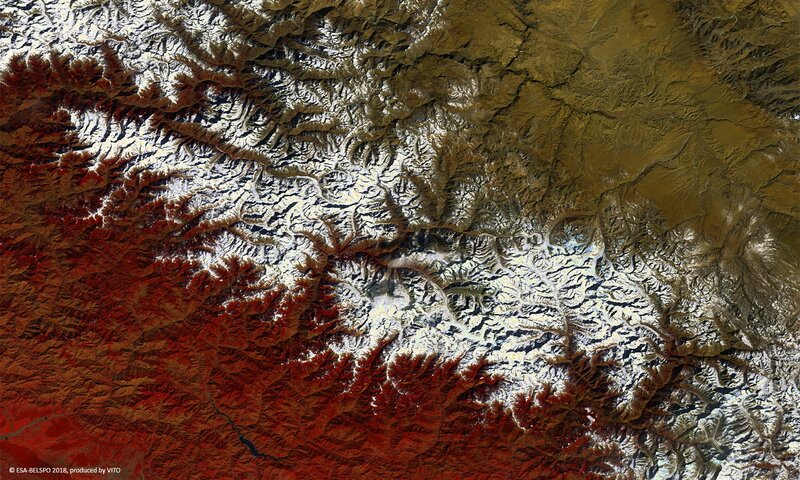 This week’s PROBA-V 100 m image nicely visualizes a part of Uttarakhand state, India (southwest) and the valleys through the rugged Himalayan mountains. Snow leopards live in the UNESCO Biosphere Reserve and national park of Nanda Devi and the Valley of Flowers, located in the valley in the southeast of the image. The park lies at an altitude over 3500m and is surrounded by mountain peaks between 6000 m and 7500 m high. The glacial valleys are of particular value to mankind as well, as they are the source of mighty rivers such as the Ganges, providing water to millions.